23rd February. This is the first blog on the new website. I pray at the lotus feet of My Guru Maharaja, my shiksha gurus and all the Vaishanavas that may I be able to write for the pleasure of Sri Sri Radha Shyamsundar and Their devotees. I was very enthusiastic today morning to start writing on new blog which got activated early morning. I thought for some time, wondering what should be the topic of my first blog. I could not come up with a topic and after some time I put these thoughts at the back of my mind, did my japa rounds and, at 8 am, listened the live lecture of HG Rukmini Krishna Das Prabhuji from Punjabi Bagh temple. Lord Rama and Lord Acyuta are tending Their cows not far from here. They are hungry and want you to give Them some of your food. 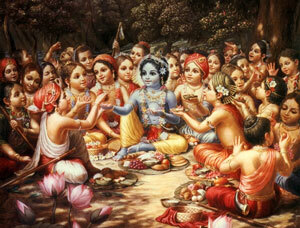 Therefore, O brāhmaṇas, O best of the knowers of religion, if you have faith please give some food to Them. As usual, Prabhuji spoke brilliantly and straight from his heart. He instructed us how we have to learn the lesson that everything we do has to be for the pleasure of the Lord and not our own self. He took reference of this verse that these brahmins who kept on doing swahaa…swahaa..busy in their yagna, as a ritual, but did not know why they are doing it or their goal was just to reach heaven, therefore they could not recognize and capitalise on the wonderful opportunity offered to them by the arrival of Krishna’s personal boyfriends. Prabhuji added that our material success does not necessarily mean that we are growing in our spiritual growth. Hence we may be a big donor or may become a successful book distributor but till the time we are not doing these activities for the pleasure of the Lord Krishna we will not get any taste in the service or even in our japa. We will become like these brahmins, doing it all as a ritual or worse, if we do them for our own pleasure – `pratishtha’, false prestige and personal ambition. Lord Sri Krishna is `Bhava Grahi’. He accepts the mood in which we do the actions, not just the action itself. Hence we should ask ourselves, Why am I chanting, for whose pleasure? So that our mood improves behind the chanting. Once the lecture was over, I paid my mental obeisances to him and closed the browser. Suddenly I realised that his lecture had such a broad hint for me. The message to me was that this new blog has to be written for the pleasure of Lord Sri Krishna and not for my own sense gratification! HG Rukmini Krishna Prabhu ji ki jai! This is my realisation for today – `write everything for the pleasure of the Lord’. I pray to Lord Balram that this message sinks deep inside my heart and I always remember to write everything for the pleasure of the Lord Sri Krishna and never for my own sense gratification. Thanks For Sharing Wonder full Article Its First Blog But It’s Amazing to read and you explain very well on this blog. thank you for posting this wonderful article its very helpful. Thank you for kind words and reading the post.